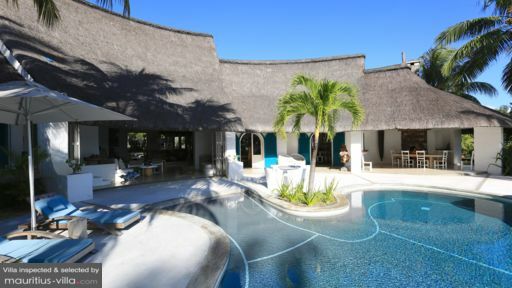 Villa Sable et Mer is situated amidst the beautiful and relatively quieter part of Mauritius, Trou d’Eau Douce Bay, or ‘sweet water hole’. The villa is not far from the tourist hub of Île aux Cerfs (Deer island), providing guests with easy access to the blue waters of Trou d’Eau Douce and the active tourism of Deer island. This 6-bedroom villa offers its guests the chance to experience a private beach, where they can spend time and enjoy with family and friends. There are 6-bedrooms in total, where one of the rooms is housed in a separate guest villa on the property. The five bedrooms are well-furnished with king-sized beds, and two of the beds are four-poster beds with draperies adding a soft, cosy touch to the rooms. All the rooms have a modern en-suite bathroom with all the necessary facilities. The rooms are decorated in a tropical style with traditional wooden furniture, essentially capturing the Mediterranean feel of the area. 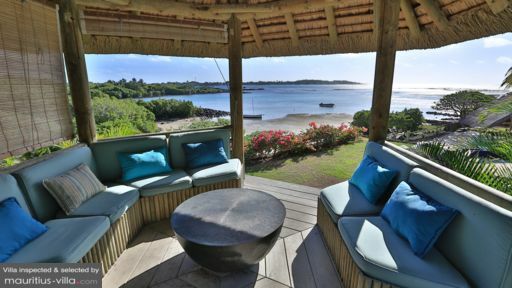 The rooms open out to the outdoors and you can leave your doors open to let the Mauritian air in during the day or night. Villa Sable et Mer is located on the seashore which means unparalleled view of the sea, sun, sand. The villa has a stunning swimming pool outside overlooking the lagoon and the boats docked at the shore. The gardens are replete with abundant foliage and trees enhancing the vacation mode. There is also an outdoor dining area around the swimming pool where guests can enjoy the breath-taking beauty of the sea and the beaches outlining the shore. Two separate kiosks hold a bar and a sitting area overlooking the beach to complete the picture-perfect setting of Villa Sable et Mer. The living area is an open-plan space, with a stone wall on one side giving it a rustic, exotic ambience and it looks out to the pool and lagoon. Guests can spend their days at ease in this comfortable space furnished with comfy sofas, chaise, and several other sitting areas. The living space is wide and spacious, and leads to an adjoining dining area which seats a large group of people comfortably. The area is flooded with natural lighting during the day and the refreshing tropical winds make it well-ventilated. There is fully-equipped kitchen with an island and bar stools connected to the living space where the chef will be only too happy to cook for you. The villa employs a group of full-time employees for the convenience and care of its guests. The staff is exceptionally friendly and cheerful and will bring a smile to you face each morning. Guests can request the staff to for anything that they might need and they can make arrangements on their behalf. If you are traveling with pets, Villa Sable et Mer is very accommodating and will let you keep your pets with you. 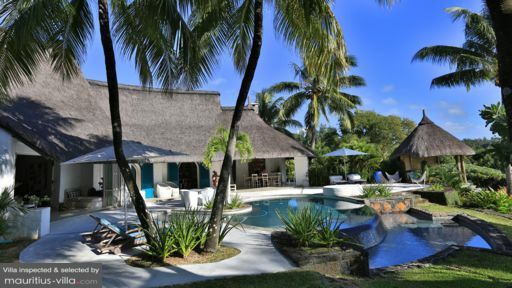 Trou d’Eau Douce Bay is a rustic fishing town and ideal for guests looking for a peaceful and restful stay in the beautiful island nation of Mauritius. Guests can roam around the seashores experiencing the hard-working lifestyle of the locals. The best part is that the tourist hub of Île aux Cerfs is a short boat-ride from the villa. Once again we spent a wonderful stay with our friends. A week of friendship and happiness thanks to your sharing… and the great staff !! Many thanks ! See you soon in Paris ! It was an awesome break in a welcoming and beautiful house. What a paradise ! Everything was perfect, thank you ! Amazing house ideally located between Sand and Sea… a Gem… like a shellfish on the sand. Thank you for the perfect service… Congratulations to the staff. I’ll come back for sure. Thank you ! Only one thought : COMING BACK, so see you soon and THANK YOU. Thanks a lot for making our holidays more luxurious and perfect ! We spent a wonderful vacation! A beautiful place, a perfect house and an irreproachable service. We hope we’ll come back to see you again ! Many thanks for welcoming us once again in your small corner of paradise. We spent 10 awesome days. And thank you again for all you did for my 70th birthday. Ines and I wish you much joy and wonderful adventures.